I have been awarded a Liebster Award. Vicky at: veryvic.blogspot.com nominated me several weeks ago. With our recent move and relocation, this post fell by the wayside (sorry, Vicky!!). I finally sat down to answer Vicky's questions, and low and behold - Lydia @ lydiasflexitariankitchen.com nominated me for another Liebster award! I don't know if this is acceptable, but I'm going to answer BOTH sets of questions in one post; first Vicky's, then Lydia's. I will share 22 (!) random facts - 11 for each nomination, and nominate 10 bloggers - 5 bloggers per nomination. Link back to your nominating blog. Answer the questions they have provided. Generate 11 questions to be answered by your nominees. Contact your nominees to let them know the news! Do you have any pets?~~~~~ I have a 16 year old kitty, Duke; a Smooth Coat Fox Terrier, Notch, and an Indian Ringneck Parakeet, Big Bird. You'll see pics of them in many of my posts and on my "about me" page, too. Who's your role model?~~~~~~ My close friends and family always influence my life, so I'd have to say they are mine. If you were stranded on a desert island and could only eat one food for the rest of your life, what would it be?~~~~~~ Pizza, hands down. What's your favorite board game?~~~~~~I haven't played a board game in years! Does Apples 2 Apples count? There is no board involved? Yes? Okay, Apples 2 Apples. Coffee, tea or hot chocolate?~~~~~~ (D) All of the above. Do you play an instrument?~~~~~~ Sure, the violin, banjo, and ukulele. Had the question been: Do you play an instrument well? Then, the answer would be: NO. (My dog howls at the first played note, just to give you some indication). How many languages do you speak?~~~~~~ Two if you count gibberish (dothego youthego spetheke githegibetherish?). Otherwise, just English. How long have you known your oldest friend?~~~~~~ I met my husband in middle school; we started "dating" in high school. This year we are celebrating our 15th anniversary. What kind of car do you drive?~~~~~~ We "share" a vehicle (when I saw "share", I mean the hubs drives mostly…….always). We have a Toyota Tundra. What did you have for lunch today?~~~~~~ Leftover guacamole on toast with bacon. Favorite adult beverage?~~~~~~ Beer. A timeless classic. What special skills do you have that would enable you to survive the zombie apocalypse?~~~~~~ Wow. My brother's prompt to read "How To Survive A Zombie Apocalypse" would really come in handy….my skill is that I would keep my brother close by, Lou - The Zombie Slayer. What’s your favorite flower?~~~~~~ Daisies. How many blog parties do you participate in?~~~~~~~ 40 recipe/craft link-ups, and 10 social media link-ups. I am at my maximum capacity!! Android or iPhone?~~~~~ iPhone, by default….I've never used an Android. What’s the name of the last movie to make you cry?~~~~~ UP! Don't be fooled by the animation. Have plenty of tissues and prepare for the ugly cry. I am an Auntie to 3 gorgeous kidos ~ I never measure out vanilla extract, I always eye-ball it ~ I feed my pets at the table (no judgy) ~ I much achieve PERFECT GRILL MARKS on my food when grilling ~ I am a huge fan of The Office ~ I watch Supernatural solely for the eyecandy ~ I do not have an active Twitter account ~ I lived in the woods, off-grid, for 5 years ~ I have harvested my own honey ~ I am First Aid Certified for cats/dog, and animal CRP certified ~ I still have music CD's ~ I just learned how to fold a fitted sheet properly ~ I have been on a cross-country road trip ~ I have never had raw sushi rolls ~ I wish I had toilet trained my cat ~ I love carbohydrates! ~ I dance with my dog - he likes it ~ I have stood on a glacier ~ I have swam in the Atlantic and the Pacific Oceans ~ humor is my coping mechanism ~ I know what's in them, yet I still love hot dogs ~ I do not want to have children ~ I will be the crazy eccentric old lady with 37 cats (I have accepted this). Okay, I threw an extra on in there...23 random facts!! Do you cross the street at designated cross walks, or jaywalk? What character on The Big Bang Theory is your inner-geek? What is your preferred method for cooking bacon? Wearing white after Labor Day.....yes or no? Would you rather be a passenger or a driver? All time favorite movie snacks? Have you ever grown your own food? Swedish Fish, or Gummy Bears? Do you have a funny voice that you use while talking to your kids/pets/loved ones? If so, describe. 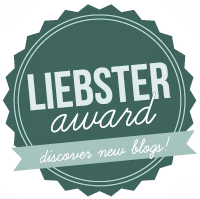 Proudly display the Liebster Award badge on your website, and go tell everyone that you just won a Liebby!! Congratulations on your award for outstanding new blog! Congratulations on getting this award Kim! It was also very interesting learning more about you. I thought I would have trouble thinking of my random facts, but once I stared I could stop. Thanks for reading, Judy! Congrats... ah thoses star wars pizzas... they will always be with me (like the force). Ha ! Thanks for reading, Diane!! Ps...came over to visit you this time from the Fluster Buster Party! You named your son after a SW character???!! !